It is a tiny creeping willow of Salicaceae family. It is adapted to survive in harsh Arctic and subarctic environments, and has a circumpolar distribution round the Arctic Ocean. 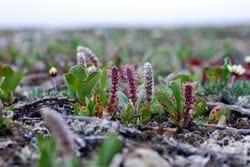 It likes cold climates, which makes the tundra a perfect place for it because the average temperatures range from -70 degrees F to 20 degrees F. The Arctic willow grows in tundra and rocky moorland, and is the northernmost woody plant in the world, occurring far above the tree line to the northern limit of land on the north coast of Greenland. Also found south in North America on high-altitude alpine tundra, south to the Sierra Nevada in California and the Rocky Mountains in New Mexico, and in Asia to Xinjiang in China. S. arctica is typically a low shrub. It has many different shapes, but sometimes has long trailing branches that root where they touch the surface. It grows to only 1�15 cm (0.39�5.91 in) in height. Sometime grows up to 25 cm (9.8 in) high), but in the Pacific Northwest, it may reach up to 50 cm (20 in) in height. The leaves are round, color is shiny green, 1�4 cm (0.39�1.57 in) long and broad, rarely up to 8 cm (3.1 in) long and. 6 cm (2.4 in) broad. The leaves of the S. arctica have also adapted to the cold weather by growing long fuzzy silvery hairs. The Arctic willow blooms in the spring. They are 5 cm and are dark brown or sparkling pink. There's no fruit on the plant, only seeds. There are no taproots on this plant. The lateral roots are shallow due to the frozen ground underneath the permafrost. It is dioecious, with male and female catkins on separate plants. 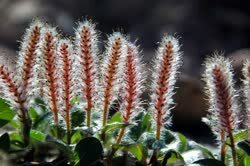 As a result, the plant's appearance varies; the female catkins are red-colored, while the male catkins are yellow-colored. 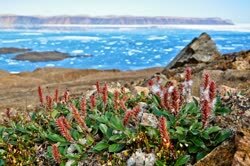 Although it's small size, it is a long-lived plant, growing too much slowly in the severe Arctic climate; one in eastern Greenland was found to be 236 years old. 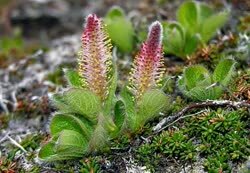 The dwarf willow has edible leaves and its roots can be peeled and bitten to relieve a sore tooth. Inuit women collect the willow fluff to mix with moss to make a wick for the qulliq. They collect enough in the autumn to last all winter. These plants also provide grazing food for muskoxen and Arctic hares. Scientific Name: Salix pulchra Cham.